A new clip from Syfy's "Dark Matter" season 2, episode 8 reveals a space station calling for help. 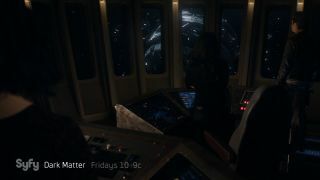 The crew of the Raza investigates a space station in distress in a new clip from the reality-bending eighth episode of "Dark Matter" Season 2, airing tonight (Aug. 19) on the Syfy channel. The space adventure show follows six crew members, who woke up with no memory at the beginning of Season 1, as they discover clues about their past and try to survive in the dangerous present. The show premiered last year and is set for a 10-episode second season. This eighth episode, which airs at 10 p.m. EDT (9 p.m. CDT), promises to be even more baffling than usual — and probes a classic science fiction trope, if the episode description is any guide (don't read if you consider episode descriptions spoilers! ): "A test of the Blink Drive goes awry, propelling the Raza to a parallel reality where the familiar is, strangely, unfamiliar."